Joyce looked at Dr. Teixido with profound skepticism. She had been sent to him for an evaluation of vertigo attacks which had become more frequent and which now prevent her from driving. She does not get headaches to speak of; her mother, brother and sister have very severe migraine problems and she has never had anything like theirs, only dull pressure in the back of her head that doesn’t stop her from doing anything and which goes away with ibuprofen. Her dull head pressure never even occurs at the time of her episodes of dizziness. Dr. Teixido placed Joyce on a safe low-dose medication. Six weeks later she was beaming, astonished her dizziness and head pressure had disappeared. She now realizes she was having migraine symptoms without the severe headache and that her symptoms were responding to a medication commonly used for migraine headache. 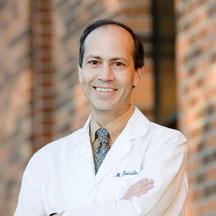 “I am so grateful for Dr. Michael Teixido’s headache clinic. In January, 2013, I was having a lot of dizziness. I went to my family doctor and had many tests done to determine the cause of this dizziness. I even went as far as an MRI of my brain, and everything came out fine. My family doctor referred me to Dr. Teixido. After a short visit, I was diagnosed with migraines. Never experiencing a headache, I was surprised to hear migraines. I responded very well to the medication with no dizziness for six months. 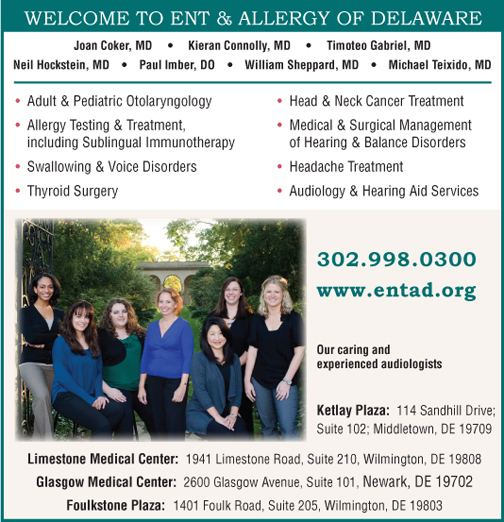 Dr. Teixido is a Delaware native and practices at ENT & Allergy of Delaware. 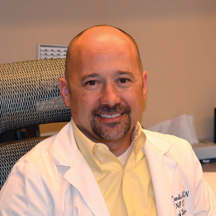 He is the director of the Balance and Mobility Center of Christiana Care, the Cochlear Implant Program of Christiana Care and of the Delaware Otologic Medicine and Surgery Fellowship training program. He teaches ear medicine and surgery regularly at Thomas Jefferson University where he is Assistant Professor, at the University of Pennsylvania, and at Drexel University, as well as nationally and internationally. For more information about migraine simply Google: Teixido Migraine. Dr. Teixido, MD, and Mark Landis MSN, RN, FNP see patients at ENT & Allergy of Delaware, Suite 210, 1941 Limestone Road, Wilmington, Delaware. Call 302 998-0300 for an evaluation.